Three different “looks” for your front page. Which would be best for your next issue? I believe that so deeply that it has become embedded in my DNA. But I’m preaching to the choir. You already have plans. You have a business plan. An advertising plan. A circulation plan. A production plan. A personnel plan. A growth plan. But (with rare exception), no design plan. What’s your design plan for the mid-term elections? What’s your design plan for Halloween? Thanksgiving? Christmas? New Year’s Day? Who’s in charge of design at your place? Who decides what approach you’re gonna take to the election? When is that plan gonna be filtered down to others? And who’s gonna lead the effort? Even for those routine time-and-again issues, what’s the plan? What do you do with that lead photo? What if it’s a vertical shot? Or horizontal? How are you gonna run the story with it? Should there be a graphic? An infobox? A logo? Your plan need not be complex. It need not attempt to answer all the questions. It really can’t. But having a selection of pre-designed models to go from would help. How about a plan for design consistency? Creating a design style guide’s a good place to start. Why not take advantage of your software? InDesign style sheets, “next” styles and nested styles can help your consistency and efficiency when designing pages. And InDesign libraries and templates are a gift to designers when they need to place standing design elements into their pages. It’s not difficult to create a solid design plan. Of course, it takes some time and effort. Or…you could just continue planning to fail. ED HENNINGER is an independent newspaper consultant and the Director of Henninger Consulting. 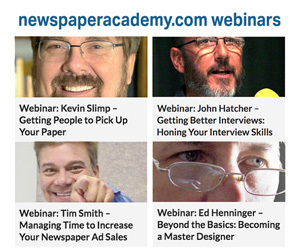 Want a free evaluation of your newspaper’s design? Just contact Ed: edh@henningerconsulting.com | 803-325-5252.
by Kevin Slimp It was a lot like other experiences I’ve had at conventions over the past couple of years. Enter your email address to subscribe to stateofnewspapers.com and receive notifications of new posts by email. Knowing who you can trust gets trickier all the time. That's where STATE OF NEWSPAPERS comes in. Because, sometimes, the truth isn't always as defined as black and white. Copyright © 2019 Newspaper Academy. All rights reserved.